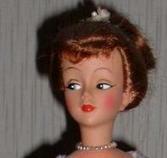 I also collect various other vintage dolls from the 1950's and 1960s' and a few from the 1970's. Carol Brent doll by Ideal doll company. Carol is 15 1/2" tall with rooted hair. She was made in 1961 for Montgomery Wards by Ideal. Here she wears a replica dress made by me. Carol Brent in her original dress and shoes. 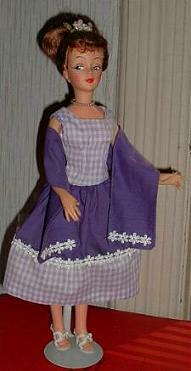 Carol Brent was made by Ideal doll company and sold through Montgomery Wards catalog. 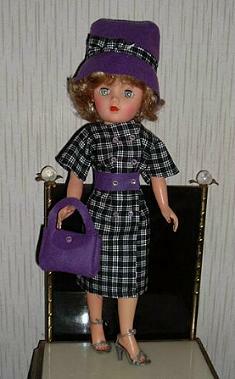 Separate outfits were also sold for this lovely 15 1/2" fashion doll. 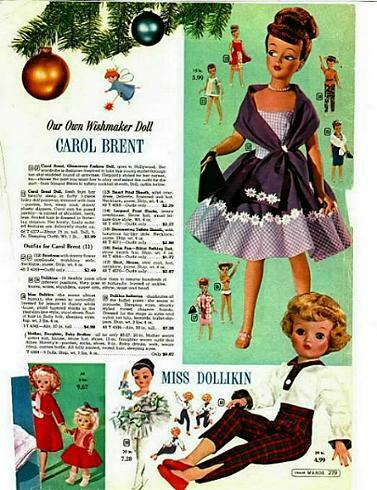 A page from the 1961 Montgomery Ward Christmas catalog showing Carol Brent and her outfits. Cosmopolitan Ginger with platinum hair. My childhood doll from 1957 wearing an original Ginny outfit. My 15" Miss Revlon doll. I love this unusual size Miss Revlon. Mine came with bad hair so she is wearing wigs. I made this wedding gown from a vintage Simplicity Miss Revlon pattern using vintage fabric from 1949 from my mother's wedding gown. Two Whimsie dolls by American Character. 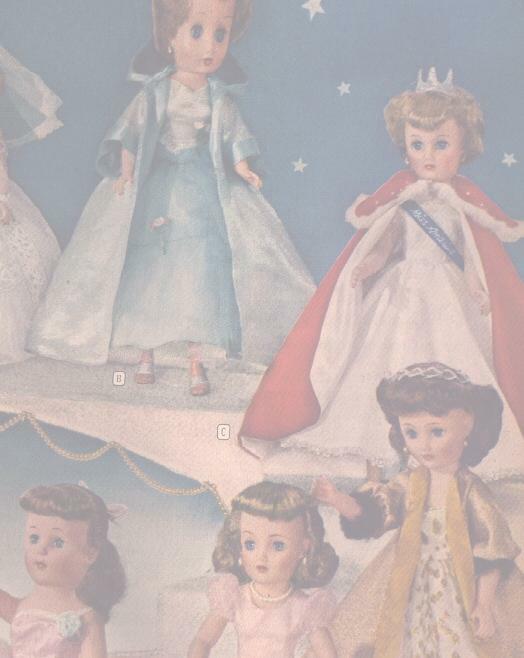 These dolls were made in 1960 and quite unusual for their size and strange elf-like appearance. There were quite a few different dolls in this collection. I have two, Bessie the Bashful Bride and Fanny the Fallen Angel. Bessie was my original childhood doll. I have since repaired her outfit, but it is mostly original. Fanny was found in her original dress but I replicated the wings and shoes. 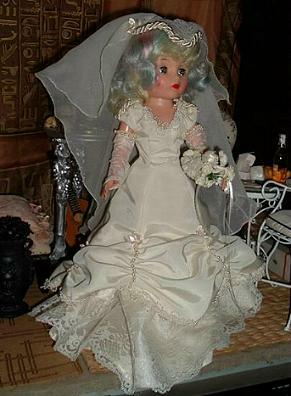 Whimsey doll Bessie the Bashful Bride. Fanny the Fallen Angel in original dress with recreated wings and shoes. This hard plastic walking doll called Mary Jane was made for one year in 1953 by GH & E Freydberg. She was a look alike doll similar to the popular Terri Lee dolls of the time. A lawsuit caused her very limited production. She has sleep eyes that "flirt" and move from side to side as she walks. She has her original hair style and hair pins but is redressed in an outfit I made for her. She is 16" tall, all hard plastic with glued on wig. A vintage unmarked black doll. Vinyl with rooted hair in a dress made by me. Tiffany Taylor doll from 1973 in blue leather dress made by me. These hard vinyl dolls are 17" tall and have a rotating head cap to change the hair color from dark to light. Tiffany Taylor with her hair rotated to the blonde side.